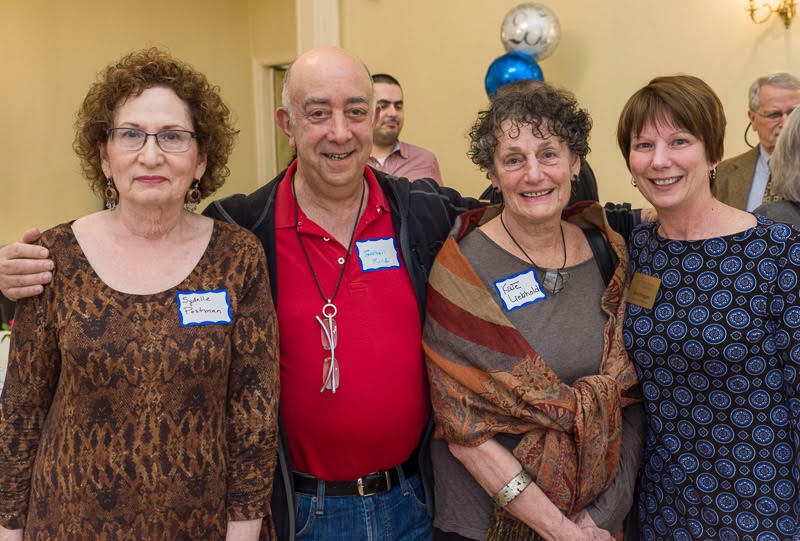 On Tuesday, March 15th at the Ridgewood Women’s Club, Bergen Family Promise (BFP) celebrated the 25th Anniversary of the Walk in Dinner program. BFP organizes dinner for anyone that shows up each evening – no questions asked. The dinners are prepared by different congregations, schools, civic groups and corporations 365 days a year and serves approximately 125 -150 guests in need of a warm meal. Over the past 25 years BFP has served over 1,000,000 dinners. UUCP has volunteered to serve for at least the past 20 years preparing a full course dinner that always gets rave reviews. Sydelle Postman, Kate Liebhold, Jon King and Steve Savitz represented UUCP at the celebration along with approximately 100 other Walk in Dinner volunteers and staff from BFP. BFP organizes the Walk in Dinner along with the Shelter Program, New Leaf Transitional Housing Program, Post Shelter support and Camp Lots of Fun. BFP is the only organization dedicated to providing shelter and support to working families who become homeless and helps them become more independent.